Marijuana operations are typically found in middle-class to high-end neighborhoods. All rooms in a house are converted to drug production except for one, which becomes a bedroom to the premise “gardener”. “Between the electrical hazards of a meter bypass and brutal booby traps, first responders need to be extremely vigilant”, says Dale Moore, Fire Protection Specialist for the Office of the Fire Marshal in Ontario. Mr. Moore worked closely with Modeltech in developing the new Mari-Grow Ops and Drug Lab simulators as visual teaching aids to train first responders. 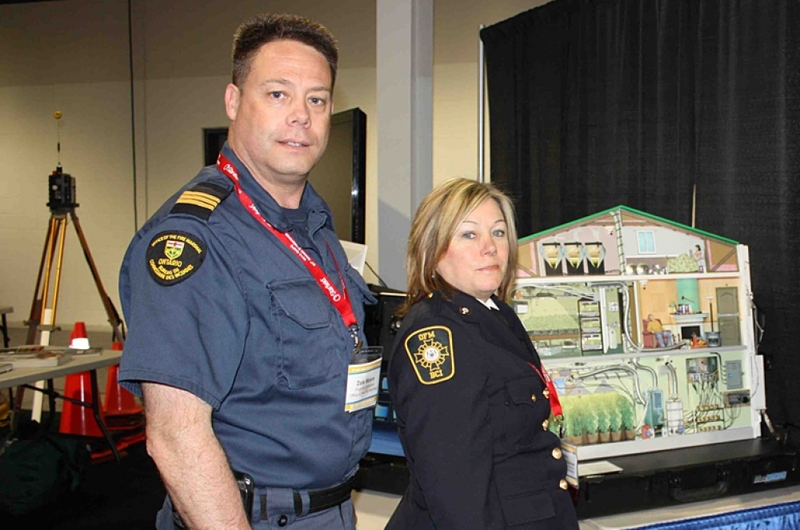 Since they were first unveiled at the Ontario OAFC Conference last May, the new simulators have been featured at the Police College in Ottawa, as part of a 2-day training workshop to the Royal Canadian Mounted Police, fire departments and fire code inspectors in London and another training session in Napanee. The smartscreen feature on the Modeltech simulator is a powerful tool to customize presentations by using real-life footage and pictures. “We have access to a vast library of material – mostly from past cases – and can share this information across organizations for training purposes”. Mr. Moore urges people to call the local police and not to act as vigilantes – clandestine drug operations are heavily defended, and even approaching a backyard window can mean putting your life in danger.